Ofsted will be carrying out early monitoring visits to all new apprenticeship providers, after the Department for Education agreed to give it extra funding. The news was announced this morning by Sean Harford, the education watchdog’s national director for education, and comes almost four months after the plan was exclusively reported by FE Week. “Great news that the Department for Education has agreed to fund us to carry out monitoring visits to ALL new apprenticeship levy providers,” he said. The move was a “recognition that these visits are making a difference and good news for all apprentices,” he added. Potentially as many as 1,200 providers could now be in scope for a monitoring visit, based on the number of ‘main’ and ’employer’ providers on the register of apprenticeship training providers that hadn’t received direct funding before May 2017. 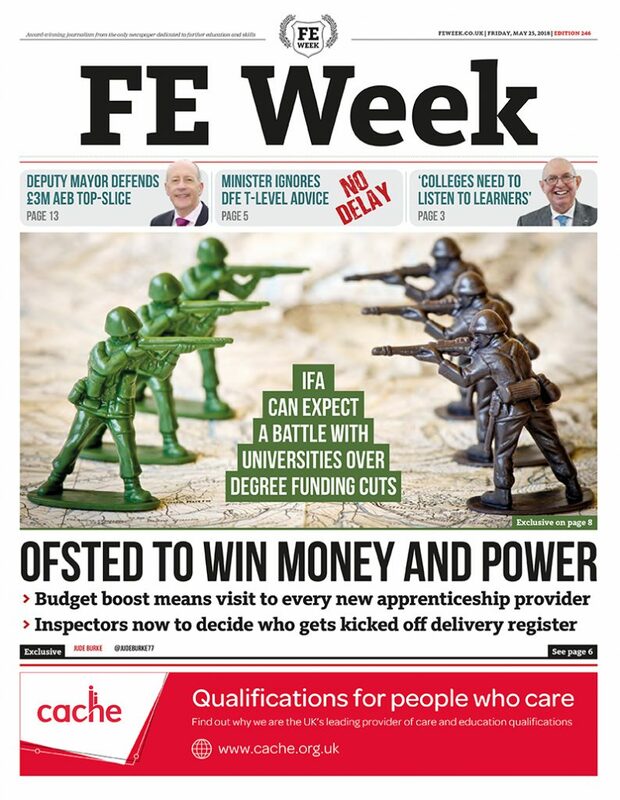 FE Week revealed in May that Ofsted was set to receive up to £7 million extra funding to carry out early monitoring visits to all new apprenticeship providers, and was also going to be given the final say over apprenticeship quality. The Education and Skills Funding Agency subsequently confirmed last month that any new provider deemed to be making ‘insufficient progress’ in any of the themes under review would be stopped from taking on new apprentices. It followed embarrassment for the government at a select committee hearing that month, when skills minister Anne Milton admitted that it wasn’t clear who was accountable for quality at these new providers after a provider deemed by Ofsted to be making ‘insufficient progress’ was allowed to take on new apprentices just two months later. At the same hearing, Paul Joyce, Ofsted’s deputy director for FE and skills, revealed the watchdog was still waiting to hear if it would be given extra resources to tackle the massive increase in providers it will have to inspect. It’s not clear exactly how much extra cash Ofsted has been given. If it is the full £7 million previously reported by FE Week, this represents a significant increase on its existing budget. According to a report published by the National Audit Office in May, the watchdog spent £10 million on inspecting FE and skills providers in the 2017-18 financial year. FE Week reported yesterday that six new apprenticeship providers had been barred from taking on new recruits, in the first evidence that the Education and Skills Funding Agency is putting its new policy into action. The providers included Key6 Group, whose provision was found to be “not fit for purpose” in the first early monitoring visit report published in March. Despite this, it had its suspension lifted just two months later by the DfE, after it provided a “robust improvement plan” – a situation that left the government red-faced after it was roundly criticised by MPs on the education select committee in May.